Spec Ops The Line is an interesting game. Dubai is an interesting location, and I can't think of a single game before Spec Ops that was set there. The sand storms make things interesting during the combat, breaking up the monotonous stop and pop shooting, but tend to force a boring brownish tint on a vast majority of the game. It is broken up by some interesting indoor sections, but these are few and far between. The game has received pretty good reviews, and this is solely based on the story (which I will get to in a bit). The gameplay itself is very standard third person military shooter fare. So much so it fails to do anything interesting throughout the 15 chapters. In fact the gun play, depending on the weapon you use, tends to feel as though it lacks any weight at all, making it not very satisfying. When you look solely at the gameplay itself, it is as simple as hide against cover, clear all enemies, move forward then repeat. If not for the story, this game would be so bland that I'm not sure I would have bothered to finish it. Having said that, lets focus on the story (Spoilers incoming). 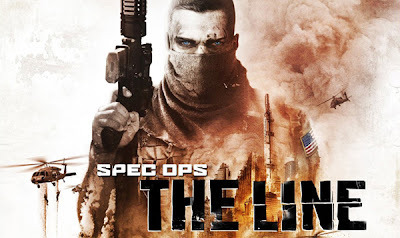 Unlike the gameplay, the story is not the typical military shooter fare. It is a character driven story in which you play as Captain Martin Walker. You lead your team through a war torn, wasteland that is Dubai. It starts with your mission to save fellow soldiers one in particular named Konrad that saved Walker in a previous fight. As you progress you end up fighting/defending yourself against hostile American soldiers. Eventually you can't shake the similarities to Heart of Darkness and you keep waiting for the famous words, "the horror, the horror." Nothing good happens during the events of this game, and with every fire fight the death toll weighs on the minds of Walker and his squad. You have to keep asking yourself if you are doing the right thing. At the moment you have to make a decision you feel like it's the right thing to do, only to find out a moment later the true consequences of your actions. No matter your intentions bad things happen and more than you realize, until the end, you are as much the villain of this story as anyone else. It is a daring story because it breaks from what so many other games do. It doesn't tell the heroic tale of some American squad going and "saving" the world, or some unfortunate victims. You only think you're being a hero until you realize that you really can't see more than two feet in front of your face. Gamers are accustomed to morality systems and choices to be made in RPG's, but not in military shooters. Decision making in Spec Ops, doesn't work the way you might be used to, you don't press A for action one, and B for action 2, you simply act one way or another. It's not until later that you see the consequences of your actions, and more often than not they leave you feeling far less than heroic. As the story continues, it is clear that the outcome of each of Walker's decisions weigh heavily on his mind. There are a lot of enemies to face throughout the game, and killing them, as well as anyone else you encounter, means something more in this story than they do in most other shooters. By the time you reach the ending you see that they blended not just story elements from "Heart of Darkness" but also "Fight Club" (as did Call of Duty Black Ops). It is interesting, and gives it a twist, but I couldn't help feeling as though I've seen this sort of thing almost too much now. Because I've seen this or something similar in movies and games before, it is interesting, but just doesn't have that shock and awe anymore. I wish I could say this has a good multiplayer mode to support it, but sadly it just doesn't. It has several modes that are pretty standard multiplayer fare. The problem is that what made the single player interesting (the story and decision making) is obviously absent from the multiplayer, leaving you with the aforementioned very standard cover based shooter fare. The games also lack the number of participants to keep things interesting. You only have 4 players per team and with even medium sized maps, the lack of players per game make it hard to find anyone to shoot at. It's also difficult to find a game to play. It took me at least 4 or 5 tries to even get into a game, and when I did it was over as soon as I joined, and then everyone left so I had to start over. It has only been out about 2 weeks and it already feels as though the multiplayer community is lacking for this game, and it is unlikely to get the kind of support from the developer to keep it going for too long. Considering it's still summer it's a bad sign that the multiplayer is struggling. It's unlikely this game will last once the bigger titles release later this fall. If you are looking for a multiplayer shooter you will likely want to look elsewhere. Despite the lacking multiplayer and the standard gameplay, this game is still worth playing through. Since it isn't published by Activision it is likely to come down in price in the coming months, so wait until it gets a price drop, or rent it and experience the story, then return it. The single player does have some replay value though. The decision making and wealth of difficulty settings will give you reason to replay the game, that is if it doesn't leave you so depressed that you don't feel like giving it another go.